Yes came to Madison on Tuesday night, and Madison said no. Well, all but about 2,000 or so fans said no to seeing the band, which made for about 8,000 empty seats at the Alliant Energy Center Coliseum. To be fair, the venerable British rock band has been playing 2,500-seat theaters in other cities on its fall tour, so Madison's seemingly poor turnout wasn't that bad. And the fans who did show up were mostly diehards, for whom, as one fan put it, Yes is like their Grateful Dead. As the show started, the fans seemed relieved and excited to find that Yes may look older, but they still have the chops of their younger selves. Or as lead singer Jon Anderson wryly put it, "Music from 30 years ago, and it seems like ... 30 years ago." Yes is the reigning champion of the progressive rock movement of the early 1970s. While their peers either folded (Emerson, Lake and Palmer) or adapted to changing tastes (Genesis), Yes remained resolutely an art rock band. All the musicians in the band's ever-shifting lineup were top-notch and not shy about showing it, making layered, elegant rock music that drew as much from folk and classical music as it did from blues or country, rock's traditional ancestors. Some of it was more than a little cheesy, but you could never say Yes wasn't pushing the envelope. But there was something about Yes' ambition and artistry that ran contrary to the ragged, do-it-yourself spirit of rock 'n' roll, though, and its detractors were as passionate as its fans. Walk into any high school cafeteria in the 1970s and early 1980s, and you wouldn't find any Yes likers -- just Yes lovers and Yes haters. Now, of course, Yes' approach to music is irrelevant to modern popular music. And that makes it seem admirable, almost noble in a way, that they're still investing so much effort into playing it. Tuesday's set completely skipped the band's more radio-friendly and commercially successful music of the 1980s in favor of their more adventurous early material. Most of the songs ran at least seven minutes long, and in some cases stretched out to 15 minutes or more, some like "Close to the Edge" featuring several distinct movements. The phenomenal guitarist Steve Howe and equally flashy bassist Chris Squire, who plays the bass like it was a lead instrument, dueled each other with furious precision for stretches of a song, and then faded back to make room for Anderson's vocals and Rick Wakeman's otherworldly keyboards. Although Anderson's trademark falsetto has a bit of a rasp to it, he can hit all the high notes he used to and had some impressive three-part harmonies with Howe and Squire on songs like "Siberian Khatru." The band closed with a majestic "Awaken," and the encore was a rousing "Starship Trooper" that got the crowd to their feet cheering. The band also made time to showcase some solo performances, the most impressive of which was a gorgeous pair of acoustic tunes by Howe and a fiery jam between the show-offy Squire and drummer Alan White. Yes also played a song from its most recent studio album, and I doubt anyone in the audience will rush out to buy it. But I'd bet good money that most of them will haul out their old vinyl Yes albums, put on the headphones and crank up the volume. Here's my comments on tonight's Yes concert(November 19, 2002) in Madison Wisconsin , at the former "Dane County Coliseum." Squire ROCKED, the band was tight and together for the most part. The crowd was small but noisily appreciative. Sound was pretty darned good- clear and crisp, but not painfully loud from my spot in the floor seats, 8th row DFC (I purchased my single ticket online within the first 5 minutes the show was on sale.) The stage lighting was interesting, I musta have noticed it 3 or 4 times, which is a lot for me, I would not notice the lighting or projection effects at all if it was not pretty cool. Did I mention that Squire's bass-pedals were outstanding-sounding? Seemed like Jon was very informal during his acoustic feature. I wonder if he always opens second set this tour with his own version of "Happy Birthday"?? Someone shouted out "Layla" to him and he responded "ya got me on my knees." There were some little audio crackles, and Steve's roadie doesn't really take care of moving the slide-guitar-cart on and off stage as much as he might. I thought it was pretty funny how Steve's sitar is mounted on a long (gooseneck?) attached to the end of the slide-cart. . . Steve definitely looks the part of the Nutty Professor! Wakeman was solid, his solo section was cool, 6 wives material and some other things too. 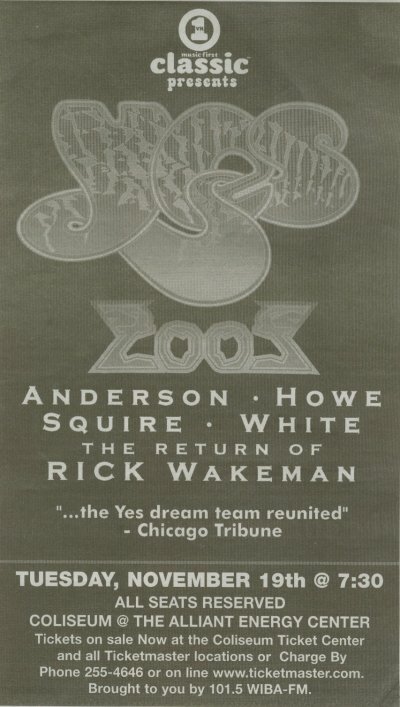 . .
For perspective, I've seen Yes 3 other times- 90125 tour, Big Generator tour, and July 2002 Chicago Theatre. This show was pretty similar to the Chicago show, but there were some minor changes which made me glad I went again. It sure is great to see Steve Howe and Rick Wakeman performing with Jon Alan and Chris. They have a really friendly, positive chemisty that's refreshing in light of how long they've been at it. Today in Madison, the weather was a little milder than it's been recently, and Jon was remarking how they just came from Ottawa and they were all cold there, and expecting Madison to be tundra. . . I guess they were pleasantly surprised at the nice climate and the warm reception despite the small number in attendance. Security was rather thorough going into the Madison show, a slow rock-and-roll pat search probably had people waiting in line when the band came out10 minutes after the scheduled start time of 7:30, I guess they don't want any liability, but I wonder what they thought they'd find in all the ladies' purses? Video Cameras perhaps? I'm not a seasoned Yes concert goer, tonight's concert in Madison, Wisconsin was my 2nd live Yes concert. The other was in 1974 during their Relayer Tour. So maybe I might have missed little things that a seasoned follower will cite as shortcomings. But from my perspective, tonight's concert was absolutely fabulous. They seemed to be enjoying themselves, exchanging words and glances thoroughout, with a lot of smiles and grins. Wakeman looked pretty dour for a while, then he and Howe played off against each other for an extended period during South Side of the Sky and I caught Rick smiling a couple of times at Steve. After that he and Squires were laughing a couple of times and both of them were chatting with & playing to the crowd in front of them over the last third of the set. I thought the performances on Siberian Khatru, SSotS, CTTE, and Heart of the Sunrise were all excellent. The encore was Starship Troopers ... they didn't play Roundabout! The people around me were bummed by that. I'd estimate that about 70% of the attendees were over 40, lots of gray hair in the audience. That is, what crowd there was, looked like around only 1500 to me. But they got into it and let Yes know that they were appreciated. It was really great to hear so many cuts from Fragile and CTTE again. They played for nearly 3 hours and everyone wanted more. I would have gladly plugged the meter again and paid for another ticket to have them continue for a couple more hours. Jon's voice was exception and he looked like he was having a good time. As great as the Relayer Tour was, I thought their performance tonight was better. Assuming they get a cut from the lobby sales, I showed my appreciation by picking up $50 of goodies on my way out. The acoustics/audio were quite good. This was in a 9,000 seat arena, with the back third masked off from view with a black curtain. It wasn't the loudest concert I've ever heard, thank goodness. The volume was just about perfect in my opinion and there were no echoes from my seat. The deep bass notes also were nicely balanced, volume wise, with the rest of the audio mix. Two of last three concerts I've attended were either too loud or too bright/harsh in the mix. This was very good. Thank you so much. I can't believe they got heaters on in here. Not used to it, we just came down from Ottawa it was...freezing, and we were [???] thought we were coming to a sort of frozen tundra land ya know. Thank you for coming out this evening. This is a new song, from last year. We recorded it last year. Thank you so much! That's a song from, ah, the album Magnification. It's, uh, in the Best Buy store now, and you can go buy it for a friend for christmas, or...Never never go there Jon - Yes, I know I know I know. Here's a song you might remember, one or two of you, not many, because you all look so young, ya do. Except ya know honestly, I'm, I'm being truthful here. So sing along please if you remember this one. Sorry its too loud. Sorry guys my fault. Thank you very much that was [???]. Mister Steve Howe, ladies and gentlemen! Mister Rick Wakeman! Bravo! I say! Bravo!! Bravo!! [???] as we continue with the Yes. . . Song. . . Book. . . Here's one from the Heart of the Sunrise"
Thank you being with us this evening, you're so wonderful! Thank you so much!